If you read my June 2018 favourites then you’ll know I’ve been loving Hungry Shark World, a mobile game app. Unlike the impressive Xbox games I’ve recently been obsessed with, this is an app that is free to download and play on your mobile phone or tablet. Although like many apps there are in-app purchases available if you feel like splashing your cash. In the game, you play as you guessed it, a shark. Your aim is to try and stay alive for as long as possible by eating creatures, objects and people. It sounds very morbid but it is actually fairly light-hearted and a great little game to pass the time with. I have become totally and utterly obsessed with the game for about four or five months now but over the last month, I have really gotten into it. I’d even go as far as saying Hungry Shark World is the best mobile game at the moment. Yeah, I love it that much. But why do I love the game so much? Simply read below to find out. The first thing I love about Hungry Shark World is the fact that it is so easy to play. You simply hold your device and control your shark with either your fingers or thumbs, I opt for my thumbs. You simply move your digit on one area of the screen to control the direction of your shark and the other area you apply pressure to “boost” your creature. The boost function basically allows your shark to speed up and seems to help your shark when it comes to eating creatures, people and objects. Your boost isn’t unlimited and refills with time and by eating certain things. Basically, it is SO easy to control although when you first play it can take a little getting used to. The second reason why I love Hungry Shark World is that it is so addictive. Once you start playing you get a proper feel for the game and you’ll for sure want to try and beat your high score, collect gems and try and make as much dollar dollar as you can. By doing so you unlock bigger sharks capable of eating more things. Not only that but by increasing their boost, bite and speed you make your shark even more powerful. You can even jazz up your shark with outfits and items to increase things like health, gold and points as well as to aid you in the game. There are also daily contests where you can compete with all other players around the world. Depending on your score you can win some pretty sick prizes. I don’t mean to impress you but once I came fourth in the world in a contest. Yes, sometimes I have WAY too much time on my hands. Anyway, the contests are always fun to partake in and stop the game from getting repetitive, well I find so anyway. You can also partake in little missions and collect daily chests to gain even more money. There are various things to do in the game so if you want to focus on say getting your shark strong as opposed to doing the contests, that is totally possible. Not only is Hungry Shark World super fun to play and a bit of light-hearted, it is also extremely pretty. The graphics are super pretty with some excellent bright colours that are very pleasing to the eye. There are various maps on the game that you can play which all offer something visually different which nicely mixes things up a little. My favourite areas so far have to be the Arctic Ocean and The Arabian Sea. Each map is fairly different from the other with both offering something incredibly gorgeous to look at. So, what is your favourite mobile game? 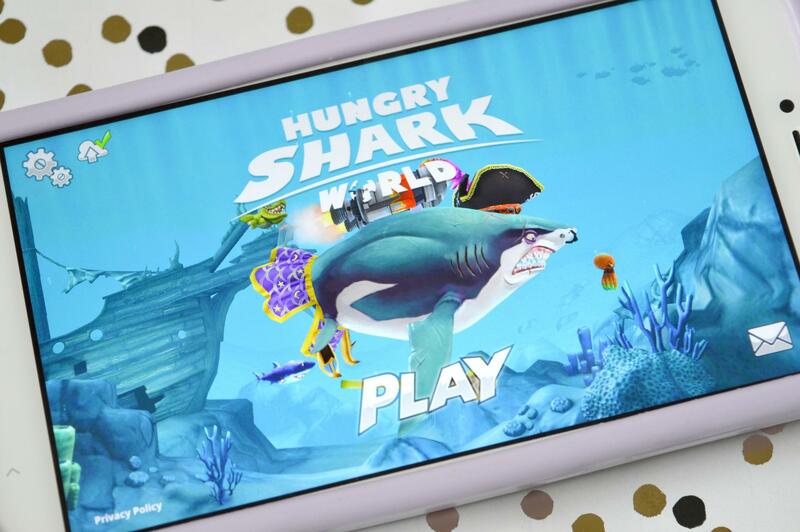 Have you played Hungry Shark World? Previous Post Should You Listen To The Blackpink Square Up EP?